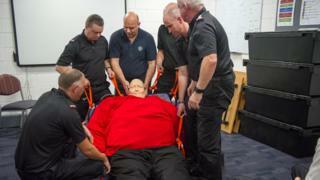 A mannequin weighing 25 stone is helping firefighters in Northamptonshire train for call-outs to obese people. Known as Barry, the model replicates the size and weight of a bariatric patient and helps crews practise safe handling and lifting. It cost Northamptonshire Fire and Rescue Service £3,500. Crews attend at least one bariatric patient each month and help the ambulance service with larger patients. As featured on The One Show on Thursday, seven firefighters are needed to safely lift the mannequin. The training helps prevent injury to everyone involved and ensure such rescues are carried out in the most dignified way possible, the fire service said. Its bulk means crews also need training on how to lift Barry through so-called pinch points of doorways and narrow halls. Station manager Gary Welch said: "Barry allows us to practise in calm and controlled non-emergency situations. "Real-life rescues are often difficult or stressful, so by being prepared everyone knows about lifting techniques and possible complications and it just helps make everything safer and smoother for everyone."